These gorgeous crystal earrings are made almost exclusively from vintage components. The 18mm rivoli cut stones were manufactured by Swarovski Crystal in the 1970s. 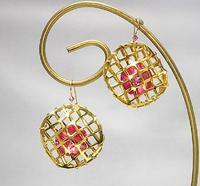 I?ve caged them in gold plated findings that are from the 1950s. Only the 14kt gold fill French hooks and the 24gg wire used to secure the cage are of recent manufacture. The combination of sparkling rose crystal and shiny gold metal is very rich and incredibly feminine. 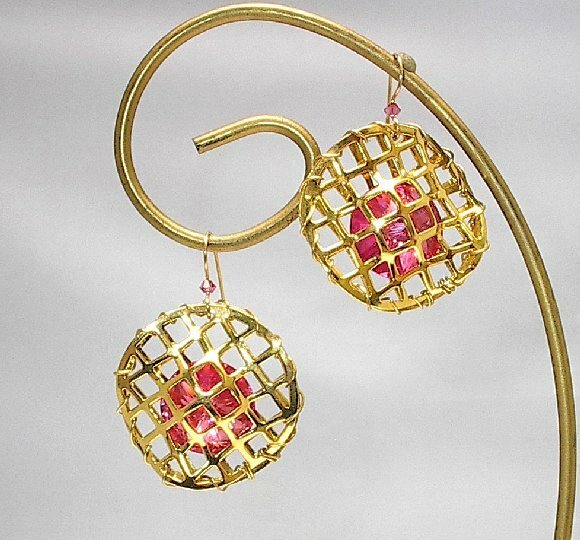 Together they make one fabulous pair of Swarovski dangle crystal earrings from SparklePlentyToo, of course.